I love this activity! I got the original idea for this activity on Pinterest (of course), but modified and expanded it to suit my students and grade level. 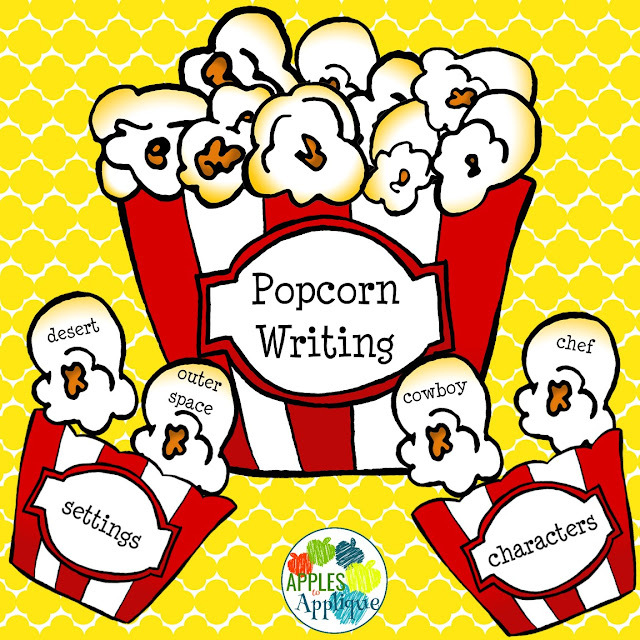 Basically, this activity is to get students started writing, and help get their creative ideas flowing. To start, I came up with a list of 30+ possible characters, ranging from "cowboy" to "monster" to "president", and everything in between. I then came up with a list of the same number of possible settings, again with a great variety, from "the future" to "a foreign country of your choice" to "the zoo". 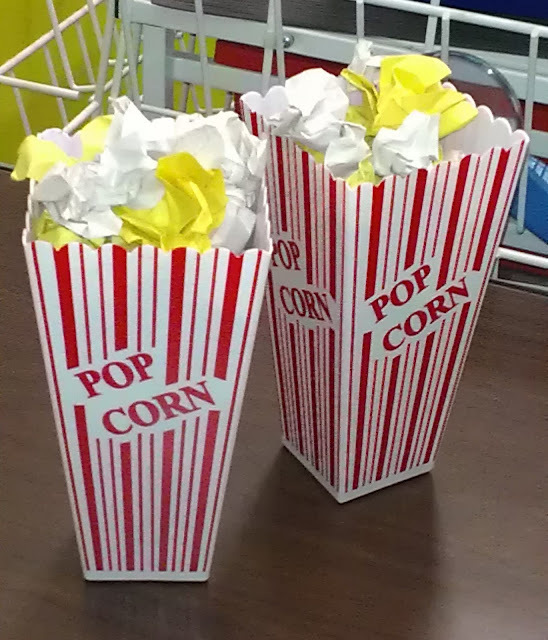 Next, I cut rough popcorn shapes from yellow and white paper. On each yellow piece, I wrote one character from the list. On each white piece, I wrote one setting. 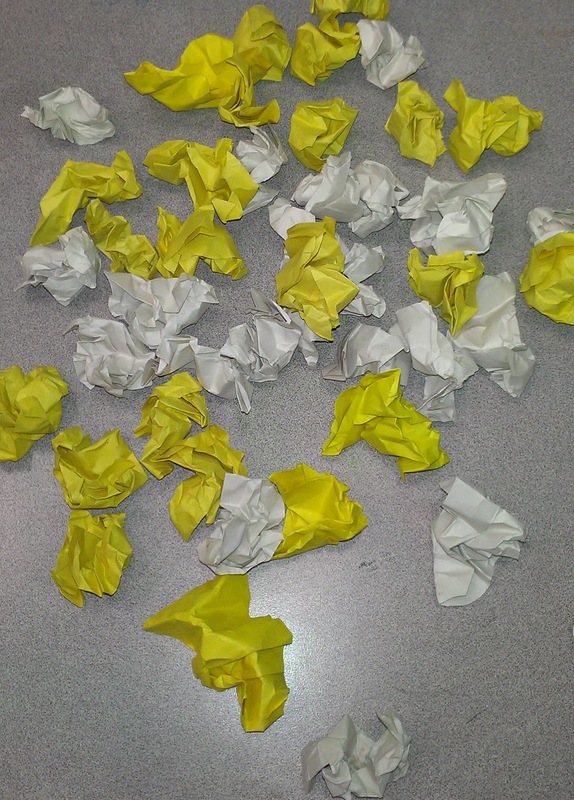 After that was done, I crumpled all of the pieces. It felt a little destructive after I had just gone through all that work, but it was kind-of fun, as well. 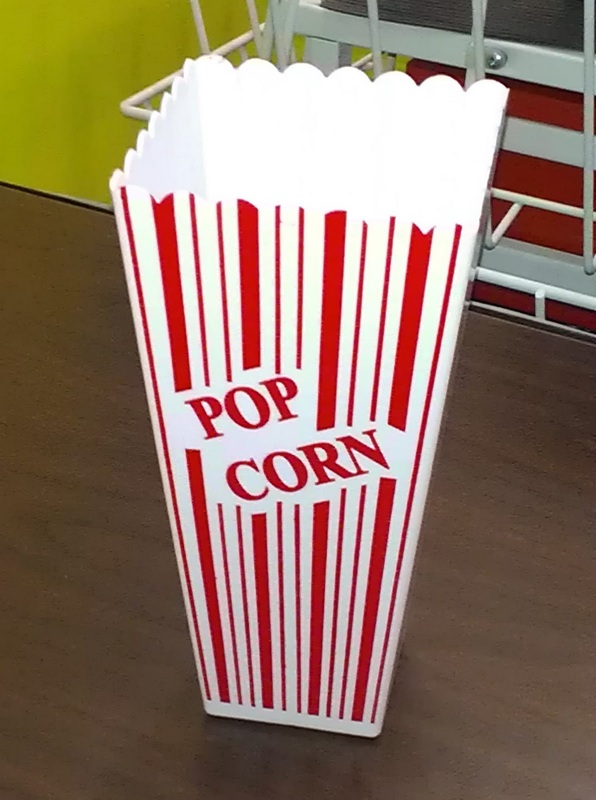 I wanted the pieces of "popcorn" to have some dimension and I also did not want students to be able to see what they were picking. Cute popcorn buckets from Target's dollar section! They're decent-sized plastic containers, perfect for the school room. Throw in the wadded up paper pieces, and suddenly you have a cute little writing center. To use, instruct students to pick one white piece and one yellow piece and to write a short story placing that character in that setting. With over 30 characters and 30 settings, there are tons of combinations, so this center can be used again and again. I think it would also be fun to have two students work together on this, either with each student picking one color, or, for more advanced students, with each student picking two pieces. 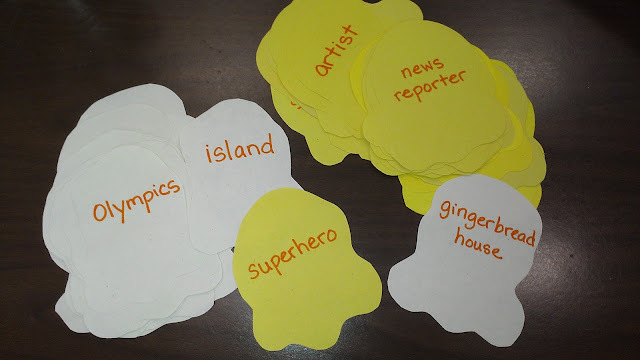 It could also be used as a small group activity to do an oral chain-storytelling. There are probably other ideas I have not thought of, so if you think of a new way to adapt this activity, please leave a comment and let me know! Enjoy! For a great idea on how to use this as a math center, go check out this post from Relief Teaching Ideas. Thank you for the comments, all! I'm glad you like the idea. This is a super idea! I will use it as part of my handwriting program. Many children who are experiencing handwriting challenges have difficulty with creative writing as well! Thanks! I'll repin! So glad you found it helpful! I hope your students enjoy! How could I use this as sequencing a plots main events?